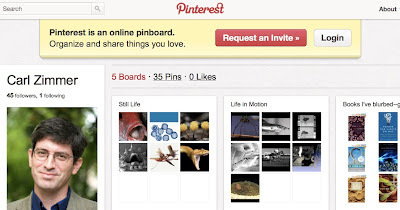 RRResearch: Could I use Pinterest to organize links to research papers? Could I use Pinterest to organize links to research papers? I spent much of yesterday going through piles of papers on my desk, throwing out some and sorting others into topic piles. Most of it was printouts of pdfs of research papers, which I keep mainly to remind me that the paper exists. Hype about the new social media site Pinterest is building, and I'm now wondering whether it might be something I could use to visually organize links to papers, rather like spreading them all out on the floor of my magically-expanded office. I don't have a Pinterest account yet (you have to request an 'invitation', for which you may have to wait a week or more), but here's how I think it works: You set up 'boards' with different topics, and then add items to them by clicking on images you find on the web. This adds the image to your board, with a title and a link to the source. What I'd like to do is create boards for different components of my research (different bacteria, different proteins or functions, etc.) with pinned links to relevant research papers. Pinterest is set up to work with images, not pdfs. Luckily, research papers almost always include figures, so if you're viewing the html version rather than the pdf version I think you should be able to pin (link to) the paper by clicking on any of its figures. The key step would be giving each link a short informative title reminding you why you wanted to remember it. Has anyone tried this? Why not use a dedicated software? I know Pinterest looks cool at first but it might get really crowded useless once you have ~97 papers on it. A much better choice would be Papers (http://www.mekentosj.com/papers/) or Mendeley (http://www.mendeley.com/). Mendeley also has a widely used social component (Papers has too but I'm not sure how many people actually take advantage of it). Pinterest tends to look like a disorganized jumble to me but it sounds like a nice adjunct to a more formal tool. Having a quick visual reminder of what I liked about a set of papers instead of trying to squint at the title or parse through the abstract sounds nice; I'll have to try it. I'm totally gonna weird out all my "normal" friends using it to plan weddings or whatever. I like Mendeley. Quite easy to organize papers according to topic, tag them, use them as references in OpenOffice/Word docs. Only drawback for me, that one must correct bibliographical data for authors etc. to have a uniform reference list. I started using it as a book-marker of open science things I came across (http://pinterest.com/figshare/). Its a more browsable layout than most bookmarking services, but the need for an image is somewhat limiting/frustrating. Great idea about papers though, looking forward to seeing how it works out. I was wondering about exactly the same thing! I've tried to use pinterest to organize my research, but the boards are visible to everyone and I would prefer to keep it private. Also Pinterest is visual, and you can make it contextual or try to make it look a bit like mind map. But unfortunately you can't include news feeds. Does anyone have seen something like that?